Everybody knows the iPod nano by now, the smallest real iPod. And now Apple also has a supersized iPod, it is even so big you have to use a satellite to see it ;-) Actually it is an advertisement stunt from Apple for their iPod. Just wanted you to know that a friend of mine has put up a website about UFOs, conspiracies and everything that's related. So if you want to know what is really going on in the world and beyond, visit his website. No its not about the movie with Pele and Sylvester Stallone but about an RFID game. The game is played in an old bank building where RFID tags are placed at several places. The players get an RFID reader PDA which they can use to read the tags. Reading tags is done by holding the reader onto a tag. The tags have information about secret codes and stuff which will help the participants to escape from the fake jail. This is a really cool game. It's one of those games that uses the digital camera on the phone. So it's a soccer game, on the phone you see a virtual soccer field with a goal. You have to film your own foot that kicks against a virtual ball. GoMonkey is a technology that gives people the possibility to interact with a (computer) screen by gestures. So they don't have to use a mouse, a keyboard or some other device to communicate with a screen, they just use gestures to navigate the content on the screen. It looks like the screen used in the movie Minority Report, but the gestures are more simple. Have a look at their website if you want to see a short movie on how it works, btw they use 2 cameras to do the gesture recognition/tracking. Unfortunately the site and the narration are in German but you will understand the movie anyway. 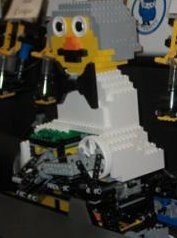 No it has nothing to do with Ruby on rails, it's a robot, constructed from Lego bricks, that can make a cocktail of your choice. You just tell the robot the cocktail you'd like. It would be really great if I could also ask him/her to make my dinner, clean the house, wash my car, etc. But I already have a wife for those things... no darling I really love you and I wouldn't want a robot to replace you. Last week we had the Step UI and today I found the row bike. Instead of using your legs to power a bike, you use your whole body to power this one. In fact you have to row this one. You must admit that it must look stupid if you see people passing by on the road like this. But maybe it looked also stupid a hundred years ago when you saw somebody passing by on a "normal" bike. Step User Interface presented on Microsoft's Techfest. This event gives the MS researchers a chance to show their work to the various product teams at Microsoft, and as such, it's an indication of work that may someday move beyond the research stage and into the hands of businesses and consumers. One of the interesting works presented this year is the Step UI. The Step UI evolved from efforts by Microsoft researchers Brian Meyers, A.J. Brush, Steven Drucker and Marc Smith to extend the current model for interacting with a desktop computer. The result creates a way to interact with a computer while dealing with a variety of repetitive tasks. The StepMail application uses an off-the-shelf “dance pad” to let a user carry out commands in e-mail — such as scroll, open, close, delete, flag and place messages in folders — by tapping a set of six buttons on the floor. Another prototype application, StepPhoto, allows foot-controlled scrolling and sorting through digital photographs. Besides giving computer users a way to stay more active at their desks, the Step UI technology has potential to help people with limited hand dexterity to work more productively. It also allows computer users to give their hands regular breaks from using their keyboard and mouse, which the Centers for Disease Control and other health organizations recommend to lower the risk of repetitive stress injuries. Microsoft researchers’ study findings will be presented at the April 2006 ACM CHI conference in Montreal. Actually the concept is quite easy and it can be done by yourself. Buy a dance pad, write some .NET code to navigate through your e-mail client and BAM you've build your own geek-fitness-workout-machine. I should buid one myself because I gained a lot of weight since Christmas and I don't seem to get rid of it.